Any of several nerves that arise in pairs from the brainstem and reach the periphery through openings in the skull. There are 12 such pairs in mammals, birds, and reptiles and usually 10 pairs in amphibians and fish. one of 10 (in ANAMNIOTES) or 12 (in AMNIOTES) peripheral nerves that emerge from the vertebrate brain as distinct from the spinal cord, passing through holes in the skull to innervate structures in the head, neck and upper body. 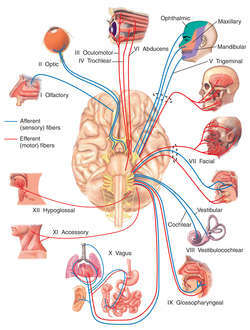 In addition, there was involvement of 5th and 7th cranial nerves. Multiple cranial nerve palsies after head injury may not carry a bad prognosis as previously thought and may be reversible, hence the need to actively treat such patients. only cranial nerve to emerge from the dorsal aspect of the brain (Fig. Sample Patient Cranial Nerve Symptoms and Mental Disorder data are presented in Table 5. Multiple cranial nerve palsies are rare; however the clinician must be aware of such cases to make sure early accurate diagnosis is achieved. 6-8 Facial pain and edema, nasal congestion or discharge, headache, multiple cranial nerve palsies, necrotic turbinates, fever, and lethargy are other common complaints. Cranial nerve involvement is unusual in Wegener's granulomatosis but may lead to significant morbidity. Each of these muscles is supplied by one of three nerves--the oculomotor, trochlear, and abducens nerves, which are also known as cranial nerves III, IV, and VI, respectively. Damage to cranial nerve II was assessed by visual acuity, color vision, pupil testing, and optic atrophy. The term superficial siderosis is used to describe the haemosiderin deposition on the surface of the brain, spinal cord, brainstem and cranial nerve leptomeninges following recurrent subarachnoid haemorrhage. My husband showed signs of 7th cranial nerve paralysis--Bell's palsy--in January 2006. A new study suggests that some Alzheimer's patients may benefit from treatment with an implanted device that electrically stimulates the vagus nerve, an important cranial nerve originating in the brain and extending to organs in the chest and abdomen.